“Hello my name is Artois. If I am alone I am lost.” In the first five minutes, Virgil (Mark Scheibmeir)Â and his girlfriend Angie (Sydney Andrews) discover a lost goat on a country road with the above message around his neck. And then the goat is gone. What just happened? That’s the question you’re likely to be asking yourself for the remainder of the film. If a guy with tape on his glasses and an overdone, vaguely European accent adding an “F” to posters that say “Artisanal Market” (so that now they say “FARTisanal Market”, get it?!?) with a magic marker is your idea of a good cinematic joke, then by all means go and check out Artois the Goat. Filled with slapstick “humor” and forehead-slapping sight gags, this seems to be a valiant effort by writer/directors Cliff and Kyle Bogart to create a visually dazzling, slightly nonsensical, take-off on last year’s Julie and Julia using a much tighter budget. They almost succeed – a goat in adult diapers is the closest they get to a solid laugh sequence – but the rest of the film is disappointing. Over-the-top characters and sets flow in and out of the film (along with a series of strange dream sequences) but the central idea seems to be that our hero Virgil has decided to become a creator of artisanal goat cheeses. He becomes obsessed with reading a French cheese guidebook and then adopts the aforementioned goat (Artois), although Artois happens to inconveniently be a male goat.Â It’s another 20 minutes or so before Virgil finally buys some milk-producing goats (with the clever (if over-acted) line “Let’s talk goats!”). The film does improve from here- it’s best in the sections that have no dialogue – but never truly becomes the type of award winning film it’s advertised as. For the film’s clearly meager budget, it’s got plenty to be proud of and plenty to recommend – the Bogarts are clearly creative and talented, but they need a bit more budget to make their idea truly come to life. 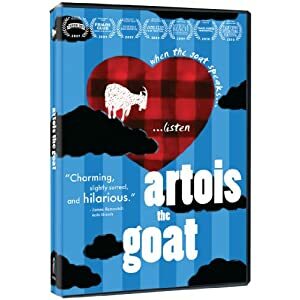 No user commented in " Movie Review: Artois the Goat "